The 10 Best Vegan and Vegetarian-Friendly Restaurants in Ohio! If your diet is of the vegan or vegetarian variety, Ohio has some hot spots for you. It’s not always easy finding a high-quality and delicious spot to enjoy a meal that suits your diet, but Ohio’s vegan and vegetarian restaurant scene is thriving. Here are the 10 best in the state! Amma translates in English to “mother,” and Amma's Kitchen makes up all their food with the loving care of a mother feeding her children. They focus on refined yet creative Indian cuisine, incorporating traditional Indian favorites with original concoctions that still use those delicious south Indian flavors. They have a knowledgeable and friendly staff willing to lend advice for even those completely new to Indian cuisine. Flavors Eatery has been serving up fine California-style cuisine with an emphasis on being healthy and flavorful. They have dozens of vegetarian and vegan friendly options, and everything is unique and delicious. If you're looking for a new vegan friendly restaurant that doesn't sacrifice flavor, then look no further. Ely's To Go was founded in 2008 and was inspired by the Asian, French, and American influences that the founders had in their life. 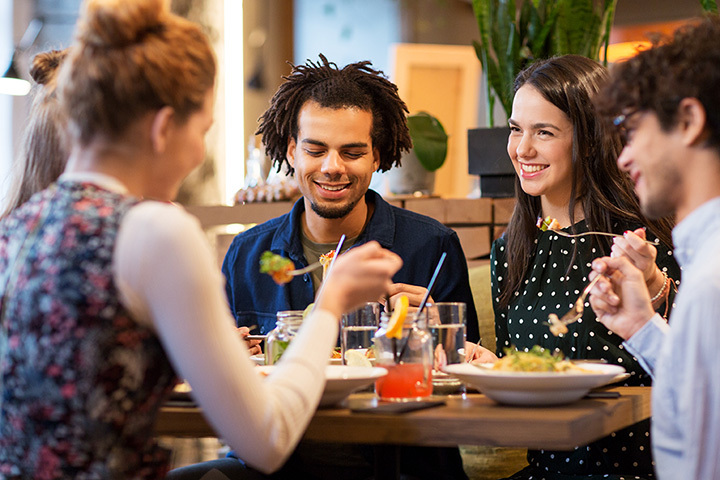 The menu is completely plant-based, so everything is vegan-friendly, but the delicious flavors bring in vegans and non-vegans alike with fresh, locally-sourced and organic menu items. The Flaming Ice Cube Cafe operates with a simple, yet complex mission. To make the world a better place. They serve healthy, compassionate, and vegan-friendly cuisine, while promoting a peaceful environment that features knitting classes, essential oils, and other positive items focused on uplifting the spirit of their guests. The Cleveland Vegan understands that being vegan represents more than just a choice in food. It's a lifestyle and a community that they seek to strengthen and empower in everything that they do. Everyone at Cleveland Vegan loves food, cooking, and their home city of Cleveland, so everything you order is fresh, healthy and delicious. Beet Jar started off as a purveyor of juice pop-ups, before opening up shop in their Ohio City location. They raised up their business by the boot straps, camping out overnight to get a deal on Vitamix blenders, and paying some of their construction workers in home-cooked meals when they were building the shop. All their sacrifices have paid off with the most delicious vegan juice bar around. Loving Hut takes their name seriously, with the vision that all beings can live in peace, love and harmony with each other and the planet. They provide gourmet vegan-friendly cuisine made with fresh ingredients, and are willing to help newcomers as they transition into a plant-based diet with delicious and healthy foods, and a compassionate spirit. Portia's Cafe is dedicated to enriching lives and creating positive change by providing health-focused options for vegetarian-friendly lifestyles. They aim to provide a welcoming and accepting space for people from all walks of life while being conscious of our impact on the environment, animals, and humankind. The Root Cafe opened its doors on the winter solstice in 2009 as a unique place with the desire to create a familiar foundation for all people. The goal for all of society to live peacefully is at the core of their community, which is accomplished by sharing culture in the form of music, art, coffee, tea, food, and love. The Happy Chicks Bakery is an independent bakery dedicated to creative flavors and artistic presentation done with kindness and love. All their treats are made with vegan ingredients, sourced from organic, local providers, and of course, delicious. All options can be ordered gluten-free, and most of the menu is soy-free, so anyone can enjoy the delicious treats at Happy Chick Bakery.